Quite simply brilliant. I (genuinely) cried. I (genuinely) laughed out loud. It's profound, touching, personal yet universal . . . I loved it. Takes us deftly from hilarity to heart-stopping hurt . . . A truly great read, full of heart. A witty, honest coming-of-age story with a subtext that tackles masculinity and manhood. Webb has a storytelling skill many would kill for. A much-needed contribution to the vital conversation about the damage gender can do. Frank and compelling . . . Laugh-out-loud funny . . . also, in parts, blink-back-tears sad. Why would I blink back tears rather than give full rein to the emotion? Well, Webb can explain. Written with wit and clarity, How Not To Be a Boy is a funny, rueful, truthful book. I enjoyed every page. A brilliant telling of a sad story, it is also a manifesto for a change in attitudes . . . I laughed innumerable times and cried twice . . . You should give a copy to any young male you care about. If you have ever loved, liked or known a man, please read this book. Very funny and wise on the perils of masculinity. 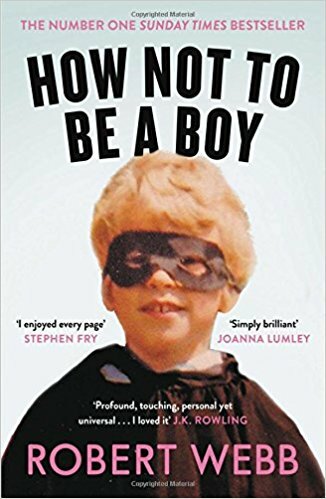 An amazing book: How Not To Be a Boy is brave, assured, immensely clever, funny and unsparing.